On Tuesday, the city of Oakland sued the Raiders and the NFL for violating antitrust and contract laws in how they went about relocating the team to Vegas. On Wednesday, in retaliation, the Raiders tore up a tentative lease agreement to play 2019 in Oakland. Coliseum Authority executive director Scott McKibben said the Raiders “formally and officially pulled their proposal off the table.” Raiders team president Marc Badain said, “We made an offer of $7.5 million in rent to the city, and that’s now off the table.” Seems like both sides are in agreement on that, at least. The Oakland Coliseum for one more year is, ultimately, the most likely outcome. Don’t expect these sides to exactly kiss or make up, but each has something the other wants (a football stadium; money), and there may not be enough time left for anything else but that to come into play. Earlier this year, the Raiders began making some contingency plans for if they had to leave Oakland before they could move into their new Vegas digs. CBS Sports reported at the time that the Raiders had approached San Diego officials about playing in the Chargers’ old stadium. The mayor’s office said earlier this week, however, that the team hadn’t yet reached out. The 49ers’ stadium in Santa Clara was built for the possibility of hosting two NFL teams—in fact, it’s specifically in the lease. City and stadium officials said on Wednesday that they had not yet spoken with the Raiders, and Mark Davis has said in the past that he really, really does not want to play there. In just the latest of a long series of episodes of unrequited love, the Raiders are probably not going to play in San Antonio’s Alamodome. 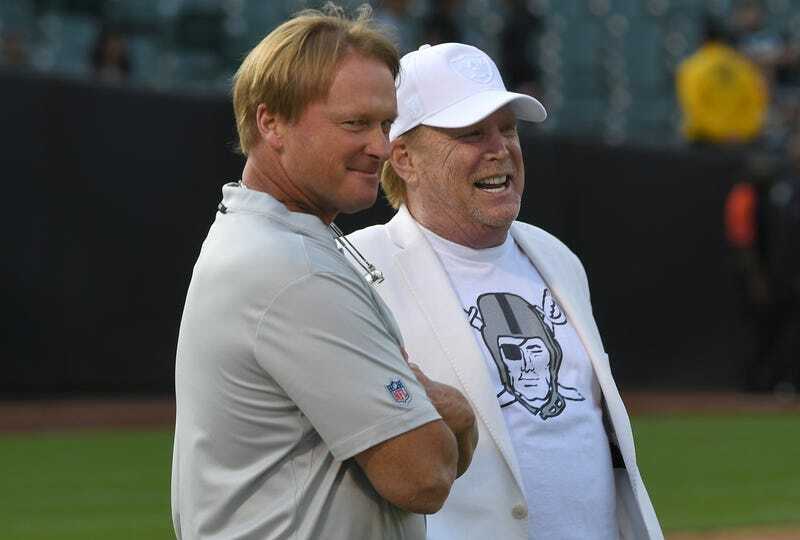 Mark Davis specifically said Wednesday that he does not want to play on artificial turf. This despite San Antonio’s mayor publicly stating that the city should host the Raiders in 2019. UNLV’s Sam Boyd Stadium is definitely not the Raiders’ first choice, no matter how much they’d love to be in Vegas as soon as possible. It’s small, and not even close to meeting NFL standards, and it’d be expensive and potentially not even possible to upgrade it before the start of next season. When earlier this year the Raiders were compiling a list of 2019 contingency plans, Sam Boyd was not on the list. A whole grab bag of weird options, including college stadiums at Berkeley, Stanford, San Jose State, the University of Nevada (Reno). Also mentioned has been the NFL stadium in Glendale, Ariz., which makes sense because I don’t think there’s another team using it. Please comment below with your suggestion on where the Raiders should play in 2019. Mine is the parking lot of the Walnut Creek P.F. Chang’s.